Favorite Credits: I’ll Say She Is, Love Marches On, Life After Bush, Moral Value Meal, 400 Years in Manhattan, and numerous performances as Groucho Marx. Tell us about I’ll Say She Is: I’ll Say She Is was the 1924 Broadway debut of the Marx Brothers, who were the greatest comedy act in history. Unlike their later Broadway musicals (The Cocoanuts and Animal Crackers), I’ll Say She Is was never filmed, and has never been revived. I’ve spent more than five years researching and adapting I’ll Say She Is, drawing from many sources to reconstruct the show, and filling in the gaps with my own Marxist intuition. We had two sold-out staged readings at Marxfest in May. And now I’ll Say She Is will be seen in full, for the first time in ninety years, at the 2014 New York International Fringe Festival in August. It’s a spectacular production, produced and directed by Trav S.D., who has recruited a dazzling team of artists to make it happen. What inspired you to write I’ll Say She Is? : The original book and lyrics were written by Will B. Johnstone, who later co-wrote some of the Brothers’ best movies. 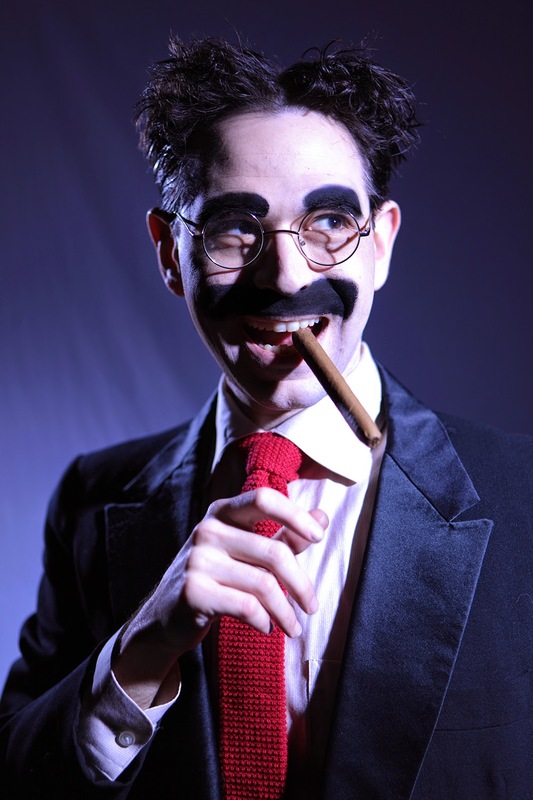 My adaptation was inspired by a profound, lifelong love of the Marx Brothers, and of musicals, and a passionate desire to bring this particular classic back from the dead. What kind of theater speaks to you? What or who inspires you as an artist? : Most of my favorite work is both silly and cerebral, rich in wordplay, often satirical, funny on serious topics, almost always musical. There’s nothing that generally inspires me to be an artist; I just get interested in specific projects, and work on them until they’re finished or abandoned (or both). If you could work with anyone you’ve yet to work with, who would it be? : Eleanor Roosevelt. What show have you recommended to your friends? : I’ll Say She Is. Who would play you in a movie about yourself and what would it be called? : The various aspects of my personality would be embodied by a whole troupe of performers from around the world, and it would be called "He Taught Us How to Love". What’s your biggest guilty pleasure? : Marijuana. What’s the most played song on your iTunes? : “Doodle-de-Do,” by Max Fleming. What’s up next? : A book which anthologizes "My Love Marches On" comic strips, along with a lot of new material. But for now, I’d like to keep doing I’ll Say She Is until someone makes us stop.